I'm very excited to share a card with you today that I made for a fabulous cause. Altenew's goal is to send cards for the elderly that live in nursing homes or shelters to let them know they are not forgotten. We would love for you to check out the Celebrating Parents Card Drive and then join this great cause by sending in cards. Here is the card that I will be sending to Altenew and hopefully it gives you some inspiration. I started by inking my card front using Altenew Crisp Dye Ink - Aqualicious. Needing a little more interest on the background I pulled out my Jet Black Ink Sprays and added a few sprays. I stamped several images from the Dotted Blooms set using Altenew Permanent Black Ink. This is a layering set but I decided to add color by using several ink pads to achieve a watercolor effect. Colors used on the flowers, Altenew Fresh Lemon, Cotton Candy, Peach Perfect. My sentiment was selected from the Build-A-Flower: Cattleya set. 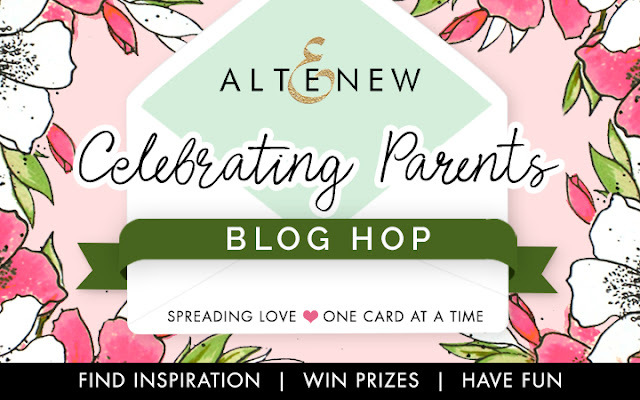 Altenew is giving away a $30 gift certificate to 6 lucky winners! Please leave a comment on the Altenew Card Blog for a chance to win. 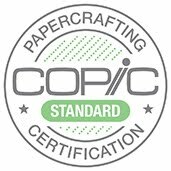 We'll also draw a winner to receive a $15 gift certificate from the comments left on each designer's blog on the blog hop list below. All winners will be announced on the Altenew Card Blog on 4/17/2019. Now on to Laura Jane. Your card will definitely brightens someone’s day. I really like this card. Thanks for sharing. Gorgeous card. I've always loved that Gradient Stripes die and it's so perfect for this layout. Lovely colors. Beautiful card - I love the colour and stippling of your background - makes me think of songbird eggs. Gorgeous card! I love stripes and that flower is so pretty. Wonderful card, technique (die), and idea! Thanks! Love your card. All the little details make it so beautiful to look at. The colouring on your flowers is amazing. Beautiful card. Dotted Blooms is a wonderful stamp set. I love the colors you chose for your flowers. Thanks for the inspiration! I love the background with the spatter! Great flowers! Stunning card for a great cause. Love this stamp set and your card! the cover die is perfect behind the dotted blooms stamp! Love the colors you chose to use, too. Someone is going to receive this beautiful card and thier day will be brightened. I love the texture that you gave this card. I'm happy to see this card drive, there are so many elders who get very few visits at all so hopefully receiving a bright card, even from a stranger, might make their day better. Lovely card Nancy! Anyone would love to receive your card. It is so pretty. lovely design Nancy! thanks for the inspiration! Very pretty, Nancy. Love your design and I truly love this stamp set. Beautiful!! That background is fabulous! Beautiful card. Love the gradient background. And the flowers are gorgeous. Beautiful colors and cool gradient stripes. Very beautiful card!! Thank you for sharing for sharing. Love the background of your card, it gives it dimension. Wonderful job. Thanks for sharing your creativity! I really like this card! It reminds me of spring when the pink dogwoods bloom and the wind is always blowing just a little, and the birds have laid eggs in their nests. My favorite so far! Beautiful card! I really like this stamp and the background is fantastic! Thank Altenew for the Card Drive. Love the background for these pretty flowers. 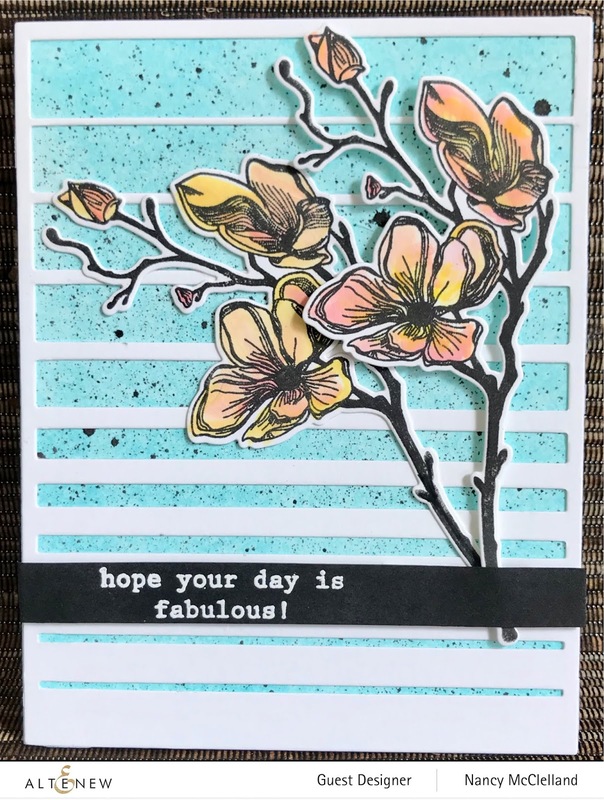 I agree....the ink spray was a perfect addition to this beautiful card! Whoever receives it will be thrilled! Awesome color combo! Love your pretty card!